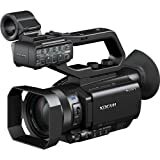 Early Sony PXW-X70 reviews have lauded this camera as a small camcorder packed with great features. What’s not to love about this camera? It’s the first compact XDCAM professional camcorder that was ever produced. And with the Sony brand, users are guaranteed to get exceptional image quality, speed of shooting and a robust performance. Imagine all of that packaged into a product that is small in size, but can be used for a wide range of applications – be it news gathering, documentary filming or events recording. This Sony PXW-X70 review will highlight the outstanding features of this camcorder so you know what to expect. The design of the PXW-X70 is ergonomic and provides users a lightweight and easy-to-use device. The 1.0 type Exmor R CMOS sensor that comes with the camera is 4K ready and is capable of achieving high resolution, high sensitivity and a wide dynamic range. The sensitivity of the PXW-X70 is 1.67 stops higher than a 1/2.88-inch sensor. It also has a higher resolution than any camera within its price range. With this kind of processing engine, images are more lifelike and it makes the addition of new features relatively easy. The PXW-X70 can be remotely controlled from a smartphone or tablet through a WiFi connection. Recorded files can be transferred to a smartphone too in MP4 format. With an NFC-enabled smartphone, one-touch authentication is possible. Simultaneous recording to two cards is supported as is relay recording where second card is used when first is full. Users can choose four different conventional mechanical ND filter positions ranging from 1/4ND, 1/16 to 1/64ND. The PXW-X70 comes with a fixed 29mm wide-angle ZEISS Vario-Sonnar T* lens which makes it great for shooting landscapes. With Clear Image Zoom, the 12x zoom capability of the device can be doubled to 24x while maintaining full resolution through the use of Super Resolution Technology. Capable of providing smooth, natural adjusting whether you want to focus or zoom in. Located on the side of the body, these allow swift and easy adjustment of aperture, ISO and shutter speed. The feature is available when recording in HD without needing any extra processing. Gradation, adjustment and basic parameters can be adjusted and saved into a profile. Up to seven profiles can be created. Users can save up to 99 camera settings using different profile numbers. Settings can be copied from one PXW-X70 to another so that shooting using multiple cameras with the same setting becomes possible. This allows the PXW-X70 to be remotely controlled without the need for an additional XLR cable. The 0.39-inch OLED viewfinder brings outstanding OLED brightness, contrast and response. The PXW-X70 comes with a 3.5-inch 1,555K dot LCD which is able to offer high resolution and flexible composition options. With this review for Sony PXW-X70, you get a good idea about what the PXW-X70 is capable of doing. It’s definitely true that some great things can come in small packages. Focus AF / MF selectable. This is a nice little camera. It’s very easy to operate. The picture quality is very good for such a compact camera, the only thing that lets it down just a bit is the highlight handling. But the camera is so clean that you can afford to expose a little lower to compensate for this. Since shooting the demo video I have been playing with the picture profiles to help with the highlight exposure and I found that bringing up the black gamma really helps as it lifts the mid range allowing you to expose slightly lower.